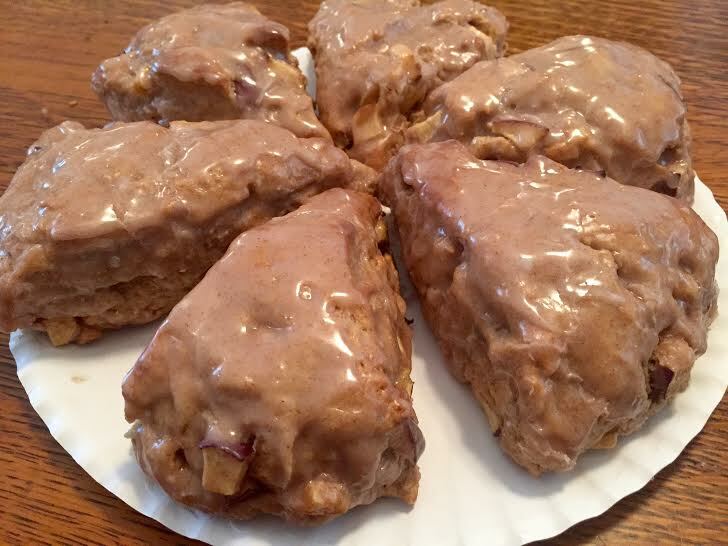 To continue my theme of Fall in the Summer, I decided to make delightful Apple Spice Scones with a Cinnamon Glaze! I swear, these smelled exactly like Apple Pie when baking, but with a hell of a lot less effort! Scones are so low maintenance to throw together, it’s one of those baked goods you can’t help but love! Add in the intoxicating scent of spices and the Fall, and you have yourself a winning combination! Begin by chopping the cold butter into small chunks. Now, core and chop your apple into fine chunks. I love the added color and health benefits of the skin, but you can certainly peel if you prefer! Place both back into the refrigerator until ready to use. Mix flour, sugar, baking powder, salt, cinnamon and nutmeg in a bowl. Add the butter chunks to the flour mixture. Evenly coat the chunks in the dry ingredients. Pinch the butter between your fingers to flatten them into discs. Do not over mix the butter! Butter chunks are a good thing in scones! Add in your apple chunks, just tossing around to coat in the flour. Mix your vanilla extract with your milk. Creating a little well in the middle of your flour and butter mixture, pour your wet ingredients in. Simply mix with a fork to initially incorporate the dough. This dough will not be sticky, so you can switch to your hands to mush it all together into a nice ball. Do not over mix your dough! Turn your dough onto a piece of parchment paper. Press out into a flat disc. I generally cut down the middle and am able to cut four decent sized scones out of each halve, giving me 8 large scones. Place your scones evenly apart on an un-greased baking sheet and bake for 14-16 minutes. 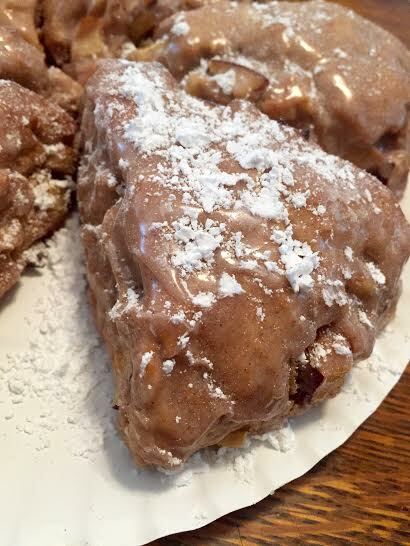 I baked for 14 – they just barely browned and were super tender in the middle. While your scones are baking, prepare your simple glaze.